Elementary school was all about the pencil. When it wasn’t about the crayon, that is. In that stage of learning the technical fine points of printing and cursive writing, the ability to erase was crucial. But somewhere along the way, in junior high or high school, the pencil became inferior to the pen. Erasers were for wussies. Much cooler to put up with the noxious fumes of whiteout for those (few) mistakes. I was also swayed by the kaleidoscope of colours available in the world of ink. I remember having a ten-colour pen at one point. Forget that the thing was about the diameter of pepper shaker and made my hand cramp up in seconds. With a click, I could switch from green to orange from one paragraph to the next. My teachers loved this as much as you might imagine. While some quickly put the kibosh on it, my English teacher, Miss Flynn, whose immeasurable positivity and open-mindedness as a teacher I’ve written about before, kindly requested that I only refrain from writing in yellow as it was too pale to easily read. I still love colours. To this day I use those four-colour bic pens regularly. 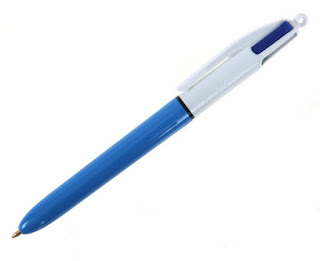 You know, the ones that are blue on bottom and white at the top with blue, black, red, and green ink tubes (if you don’t know what I’m talking about we can no longer be friends). Ok, I'll just show you. Supposedly, they come in red and green casings also, though I have never seen one of these. I can only find them at Staples (I think everyone else stopped carrying them sometime in the 70s) and have three or four of them in my desk right now that have run out of blue and/or black because, like everyone else, I have bought into the notion that blue and black are superior to red or green when writing full sentences or signing my name. Red I sort of understand, but really, how is blue any easier on the eyes than green? Maybe I need to stop searching for logic in the random conventions society adopts? Yeah, I know. University brought about another switch. After making multiple errors on a Linear Algebra midterm, leading me to scribble out entire sections and fill in my answers on whatever free margin space I could find (I would have failed miserably if yet another wonderful teacher hadn't had the patience to follow the numbered road map of sorts I created for him to find my multi-step answers), I decided it was time to revive the pencil. Actually, at the end of said midterm the professor had written ‘bit hard to follow’—understatement of the year—‘pencil next time, please.’ But, knowing not all professors would have his patience, I carried his advice over to all other classes. I immediately wondered why I’d given up the pencil in the first place. I loved the slightly rough feel of the graphite on the page. And that eraser? Well, if that wasn't just the best thing since Adam and Eve left the garden. I didn't even have to give up my love of colours. That four colour pen plus a highlighter and I still had technicolour notes and diagrams to study. You may be wondering by now if I have a point. I do. Creativity is a delicate creature. The more we can identify and understand what puts us in that creative mode, the better off we’ll be. For me, writing with a pencil improves the flow when I’m in that initial-creation stage. I've talked about how it feels a bit like drawing, which seems to spark the creative parts of my brain. Today, while I actually sat chewing on my pencil, I realized there was another layer to it. The smell of the wood and graphite (especially in that moment when sharpening and the shavings fall off) was putting me in a good mood--even though my writing at that moment was going nowhere. Odd. Then it struck me. Grade-five math class! Yep you read that right. The smell reminded me of math class. I loved math in grade five. I was actually excited when Mr. Grant told us to take out our math books (don't judge). I remember burning through those problems in my notebook. I was happy. I was productive. The whole room smelled like wood, graphite, and paper. Art period in Mr. Grant's class was a pleasure too, which I've also mentioned before and may have something to do with this happy association. Whether you write, paint, sew, work with wood, or whatever else your creative outlet might be, what is it that puts you in the contented mood that drew you to the activity in the first place? Where did those feelings come from? Is there a way you can encourage those positive associations even more with changes to your tools or surroundings that might enhance your creativity and productivity? Something to think about. As important as it is to learn how to edit, critique, and analyse your final product for future improvement, first you need to make the best of the creative process. That’s what we’re really in it for, anyway. Isn't it?